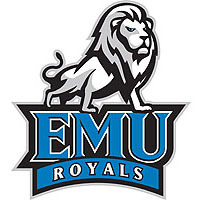 In a battle packed with 14 lead changes and nine ties, one cold spell in the second half provided the final margin as Lynchburg held off the EMU Runnin Royals, 83-74. EMU’s basketball men fall to 7-11 overall and 2-8 in the tough ODAC, while the Hornets move into a tie for second place in the league at 7-3. The first half was back-and-forth, full of short runs and lead changes. Lynchburg held the biggest margin at 16-9, and was on top at intermission, 34-33. The pattern continued into the second. With 12:11 left on the clock, Jerome Jones (Charles Town, W.V./Washington) hit a pair of free throws to go ahead, 54-53. EMU suddenly went cold, however, and didn’t score for the next four minutes. The Hornets methodically executed a 12-0 run to earn a 65-54 lead with just over eight minutes to play. Maleke Jones (Charles Town, W.V./Washington) put in a layup and then nailed a three to chisel back within 65-59, but the Royals couldn’t manage another run the rest of the way. LC’s Zack Burnett controlled the final minute, personally going 5-for-6 from the free throw line to keep EMU at arm’s length. The men shot 40% from the floor, including 39% from three. They even had a 46-41 rebounding edge, helped by 12 offensive boards, but were undone by a 17-10 turnover deficit. Isaiah Harris-Winn (Frederick, Md./St. Maria Goretti) led all players with 21 points while RaShawn Latimer (Warrenton, Va./Kettle Run) dumped in 18. Maleke Jones scored 15 with a game high five assist. Sammy Thomas (Owings, Md./Northern) cleaned the glass with 11 rebounds. A.J. Hamilton had 17 points and seven rebounds to lead four Hornets in double figure scoring. Alex Graves had 12 points, seven boards and four blocked shots. Eastern Mennonite heads to Shenandoah on Wednesday. Game time with the Hornets is 7:00pm.